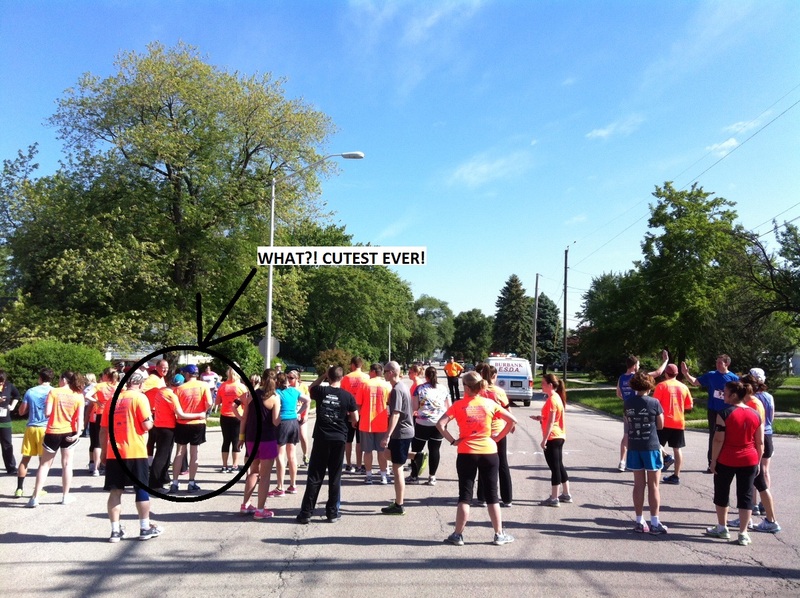 Luckily, the race we were registered for had already taken care of this issue for us in the title. Whoever named the first annual Super Sunny 5K, coordinated by Garden Center Services and brought to my attention by fellow runner and Garden Center Services employee Annabelle is either extremely lucky or has amazing weather prediction skills, because the race name fit the morning perfectly. Burbank is about a 40 minute drive from Chicago and the only other time I've been here was for the similarly weather-themed Frosty 5K back in January. And, as it turns out, this race follows the same course, starting and finishing in the parking lot of the ever-popular Henry Lang Recreation Center. Surprising to almost no one, the weather in Burbank is quite a bit better in June than it is in January. 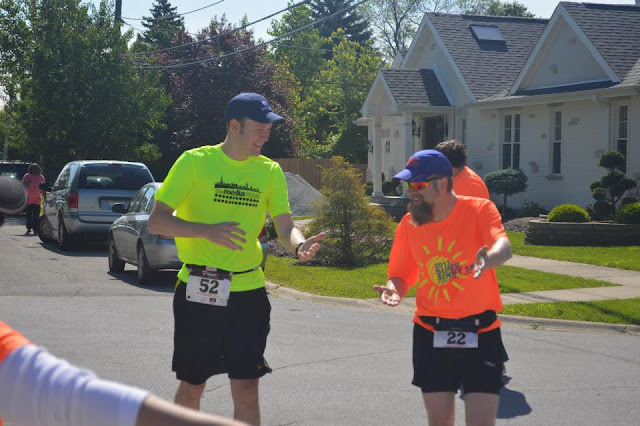 Still, there were much fewer runners in the Super Sunny 5K (about 60) than the Frosty 5K (about 500) - Frosty's run nine times though, while this was the first time for Super Sunny. We pulled up about 20 minutes early and got our sweet neon-orange shirts - seriously, check those things out. I doubt you have a shirt that color. I have seen a lot of running shirts in my day and I can't remember one this color. So someone in the planning department was doing something right. The race started on time (9am) and the course instructions were extremely specific. "Start at intersection of 81st & Oak Park, 25' 10" south of stop sign at NW corner. 26' N of telephone pole at SW corner." Yes, that starting line is measured down to the inch. What's most interesting about that is that while this race was timed, it wasn't chip-timed, so all times were rough times anyway. Still, though. Great directions. The searing cold winds that I remembered from the Frosty 5K were gone, replaced with a quiet little neighborhood with a lot of tress and not too much shade. But the volunteers were friendly and seemed excited to be there, which always makes a big difference. The finish line was a bit weird. There was a little chute lined up, where volunteers called out your time and took the bottom tag off your bib. But first off, those things aren't exactly easy to take off, and second, trying to scoot into a very thin, curvy chute at the end of a race is not as simple as it might sound. I don't mind the old-school timing method (or pulling the numbers off of bibs to track finish order) but this finish chute needs to be expanded for next year. Afterwards there were several tents set up in the park area behind the recreation center. There was some grilling going on, a very excited DJ and a silent auction. It looked like a pretty sweet little community gathering, but we were ready to get some food right away so we took off. I'd definitely run this one again (and next year I plan not to have an IT band injury while running it). Such a fun time! It was immensely sunny, for sure.